Sellacious lays its foot in offering you effective management and administration of your store, Manage stock and over sales limit of product of your store with just few clicks, We indulge in offering you advantageous panel putting in place the idea of bulk management to bulk edit your inventory or store products better in absolutely no time. Offering variants of products to your buyers should not come as hefty management to you, With Sellacious, you can update the value of multiple variants in a single go as well as different stocks for different variants of the same product. In Instance, You can have 3 different sizes for same products and can update stock for each variant particularly. In view of efficient and effective management, Sellacious phase in the idea of Bulk management making the administration of your store time productive. 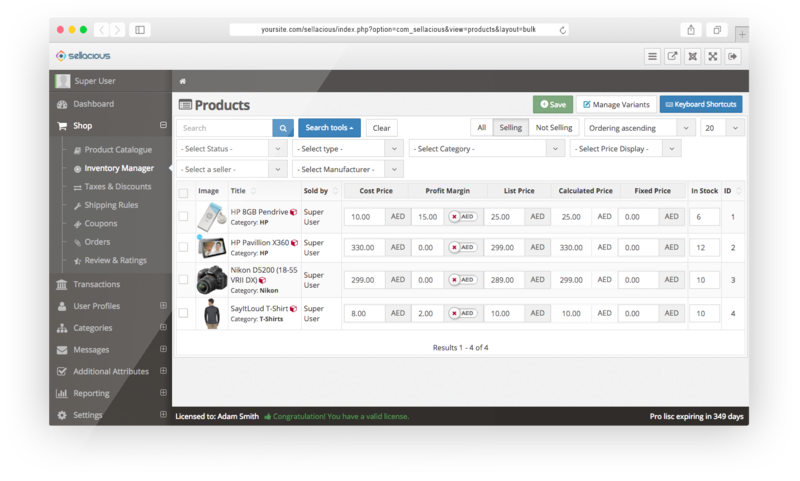 With us, Bulk edit your inventory or store products better in absolutely no time. With sellacious, Stock updation is now effortless and smooth taking least of your time, Updating the stock and inventory as easy as few clicks here and few clicks there. Introducing the idea of automatic inventory management on the basis of order statuses. We never let you loose your buyers, use over sales limit as your pre-order tool. Using the feature of sellacious, set how many products can be ordered even after the product is unavailable. Utilise the mark to have insights of pre-sales of your products.